Along the medial ridge of the brain (from ear to ear) are two strips of cortical (brain) material called the central sulcus. One strip of cortical material represents feeling while another represents motor activity (muscular control). By systematically identifying and activating each part represented in the brain, the consciousness moves deliberately to the center of the brain where the pineal and pituitary glands exist. 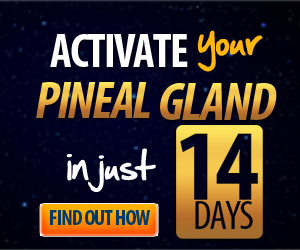 This imagery focuses on the space between the pineal gland (above and slightly behind the ears) and the pituitary gland (slightly ahead of the ears). From the time of St Augustine until the seventeenth century there were almost no significant developments, and even in the seventeenth century new ideas were restricted by doctrine. Even so great a thinker as Descartes accepted Galen's basic ideas, although he thought that animal spirits were sent from the pineal gland on special courses through the brain until they came to the part where memory could be triggered. The more clear-cut these courses, the more readily, he thought, would they open when animal spirits travelled through them. It was in this way that he explained the improvement of memory and the development of what are known as memory traces. A memory trace is a physical change in the nervous system that was not present before learning. The trace enables us to recall. Now that your body is completely relaxed and you are aware of every part, imagine that you are standing in the very center of your own brain. 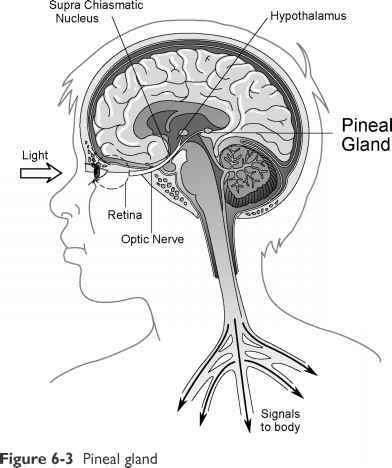 You are only a quarter of an inch tall and you can stand easily within the small cavity that is formed by your pineal gland above and your pituitary gland below. It is safe and warm and comfortable. You notice a wonderful and strange thing this place is full of light, memories, visions of understanding, intuitions, flashes of inspiration, feelings of connectedness and relationship with all life. Notice how these images pass by you like beautifully colored birds, flowing pictures, and primary shapes. Allow the understandings to come to you naturally and easily. Notice how your body feels with each image you encounter. Just make note of it and let it pass by. Interestingly, more than 50 percent of those people 65 years old and older experience regular disruptions of sleep cycles. Many elders do not produce sufficient quantities of melatonin or do not have sufficient melatonin receptors in the brain.6 This inhibits the ability to initiate and maintain sleep during the night. Melatonin is produced by the pineal gland in the brain in rhythmical cycles, with high production levels at night and minute quantities produced during the day. See Figure 6-3.